Giant Bear and I organised a two-day wedding, hen party, stag do and honeymoon in less than four months, for just under £6k. Here’s how we did it: i. prioritising; ii. making stuff; iii. letting people help. In this post, I’m going to talk about letting people help. Having a short engagement helps you focus. There wasn’t time to agonise– we just went with our first instincts and moved onto the next thing. For example, we didn’t do ‘save the date’ cards – we picked dates and sent out the invitations (Etsy, £60) as quickly as we could. We made RSVP cards (moo.com, £30), with tick-boxes on the back and an image of engagement rings on the front (our house was built in Queen Victoria’s jubilee year and we have a commemorative book full of glorious Victorian adverts). I tied the invitations up with fancy yarn (Darn Good Yarn , $20) to make our budget invitations look cheerful and bright. Each invitation (card, envelope, postcard, yarn and stamp) cost less than £1.50. We also invited (by email) more distant friends who live or work close to church to just come to the church service, which we held at 1.15pm so they could nip out in their lunch hour. This was a very easy (and completely free!) way to include lots of people we couldn’t afford to invite to the reception, or who couldn’t get the afternoon off. Everyone loves a summer garden party wedding with croquet and Pimms and sunburn, but it costs so much money; and you still have absolutely no guarantee of good weather. Our reception was on a Wednesday in April and hiring the venue cost us £725. A Saturday in July would have cost us over four times as much. Nobody minded traveling during the week because they had nearly four months’ notice to arrange time off, and we had glorious weather for both wedding and honeymoon. not bad for April eh? Personal Opinion Alert: I think it’s vulgar to ask for wedding presents. We made it *very* clear on the invitations that nobody was expected to buy us anything. Several guests said how much they appreciated being told not to worry about gifts, and that they felt we genuinely wanted their good wishes, rather than their money. We *did* have a list of gifts (because some people will still want to buy you something, so you might as well help them buy something you actually need), but they were all under £35 and mostly fun, cheap things like comedy ice-cube trays and film posters. Inspired by our homemade wedding, some people made gifts, including cakes, chocolates and flapjacks for afternoon tea. Giant Bear’s godfather drove us to the civil ceremony in his classic car; another friend wrote a poem about our relationship, which he insisted on reading aloud at the reception (sounds awful but wasn’t); another wrote a piece of music for the choir to sing at the church ceremony. I have a lot of Chinese friends, and in that culture everyone gives money to newly-weds, so we wanted to make it easy for people to give us money *if they so chose*. Our invitation read as follows: ‘if you simply prefer to send us some filthy lucre, you can be modern via PayPal , or old- fashioned via cheque. Any money will be put towards our honeymoon.’ We were given £1,000 towards our photography as a wedding gift from my amazing parents-in-law; other people sent us various sums of money, large and small. This added up to just under £750, so even though we had made it clear nobody needed to give us anything, almost a third of our budget came from gifts we hadn’t asked for. 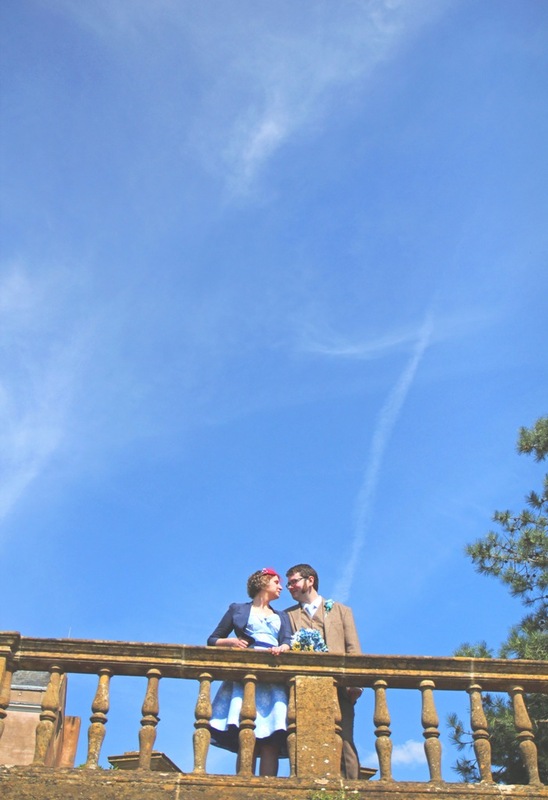 We spent the majority on our honeymoon, and took lots of photographs, which we posted on Facebook or sent via email, to make the monetary gifts meaningful and show we appreciated them (e.g. 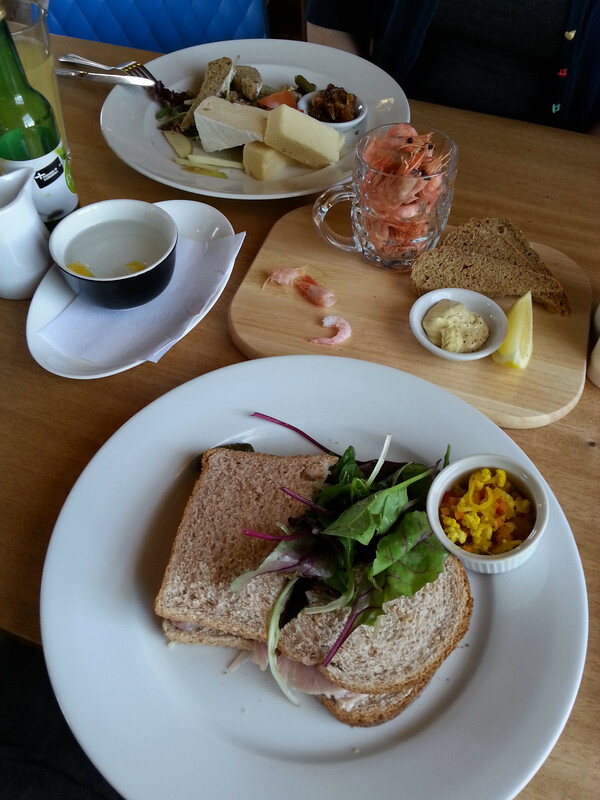 ‘Here we are eating a lovely lunch in Marazion. This meal was sponsored by . Thanks, !’). lunch sponsored by auntie Ethel..
My hen party was an evening tea-party in a local café, at which we made all the flowers for the tables at the reception (I needed to come up with something suitable for my twenty- something friends and Giant Bear’s octogenarian grandmother). 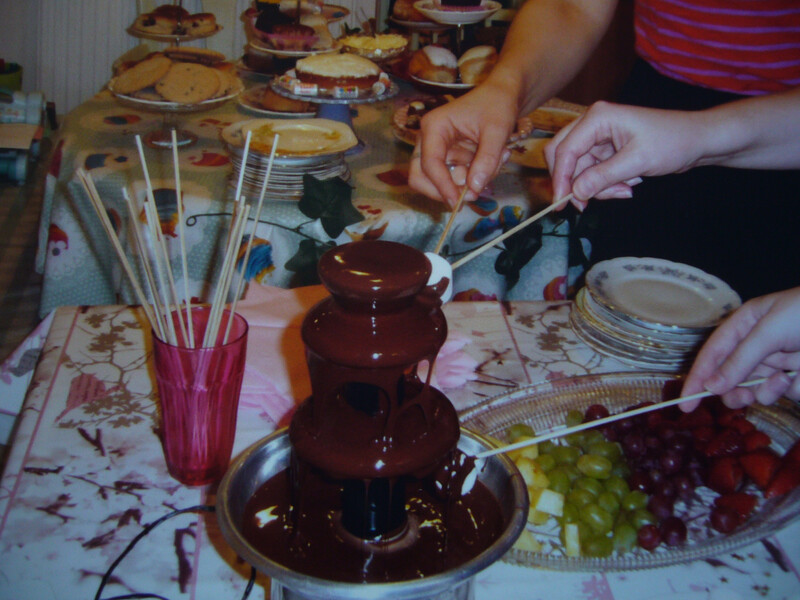 We had a blast: there was a chocolate fountain, every kind of cake, scone and fruit salad known to man, mocktails, tea and hot chocolate. 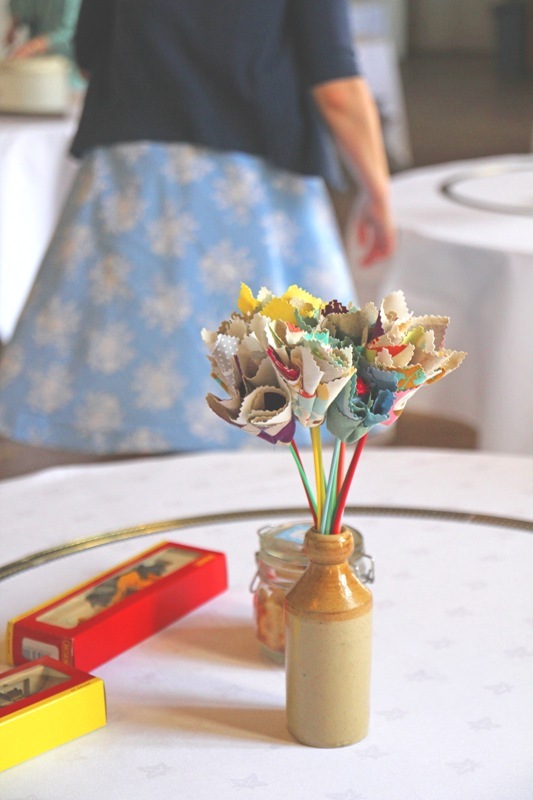 Everyone paid for themselves (Crafty Teacup , £15 per head) and we spent the evening making flowers out of scraps of wedding dress fabric and vintage knitting needles. We made nearly a hundred flowers, which cost us virtually nothing (knitting needles, charity shops, total £8; fabric, dressmaking scraps) and looked amazing in old ginger beer bottles (Ebay, £4 each). I’m in the process of dismantling the flowers to make a quilt. My bouquet lives in a vase looking spiffy, and I even bought some short children’s knitting needles (Ebay, £2) to make buttonholes. Several friends who couldn’t be at the wedding could make the hen party, and really appreciated being included. Everyone felt that they had contributed and at the reception I noticed several ladies checking to see if the flowers on their table included ones they had made. Similarly, the stag party at our house included communal cake-making at 11pm (an unexpected response to my ultimatum of ‘help me with the simnel cake or go home’), which we then served at afternoon tea after church. I was very proud that our wedding was homemade and second-hand. Nobody knows (or cares) that your ring is Cartier and your dress is Vera Wang unless you tell them; equally, nobody knows that your confetti came from a wedding that got cancelled unless you tell them. The confetti was made entirely from dried flowers and herbs, organic, grown locally, and in gorgeous little organza bags. I bought everything they had for £13. Bish bash bosh.